French tosafist; born at Narbonne about 1120. He was a member of the rabbinical college of Narbonne and, with Abraham ben Isaac, ab bet din, and other rabbis, was one of the signatories of a responsum issued there about 1150 ("Teshubot ha-Rambam," p. 4, Leipsic, 1859; "Kol Bo," No. 20). 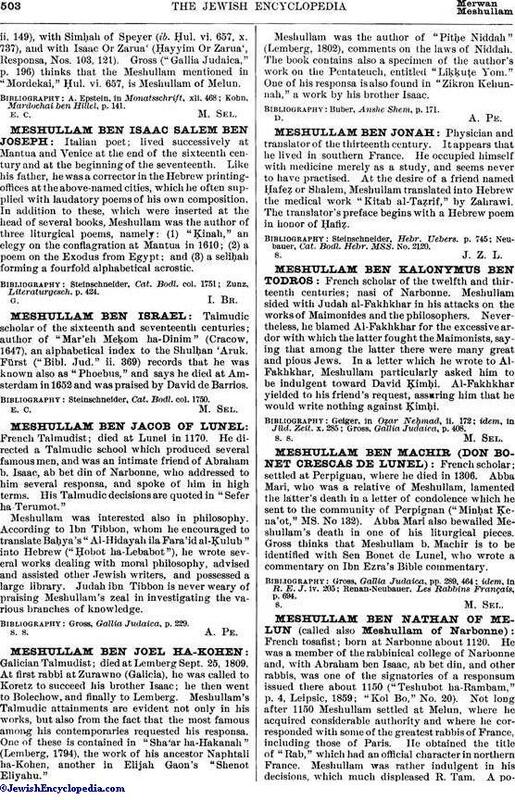 Not long after 1150 Meshullam settled at Melun, where he acquired considerable authority and where he corresponded with some of the greatest rabbis of France, including those of Paris. He obtained the title of "Rab," which had an official character in northern France. Meshullam was rather indulgent in his decisions, which much displeased R. Tam. A polemicalcorrespondence ensued between these two scholars, and Meshullam, in spite of his clever dialectics, was obliged to submit in fear of excommunication (comp. R. Tam, "Sefer ha-Yashar," pp. 72-76; Tos. to Pes. 105a; Beẓah 16a; 'Ab. Zarah 29b; "Mordekai," Shab. iv. 334 et passim). Gross (in "Monatsschrift," xvi. 290) and Kohn (ib. xxvi. 143) declared that Meshullam b. Nathan of Melun and Meshullam of Narbonne were two different persons, though Gross afterward surrendered this opinion and identified them. 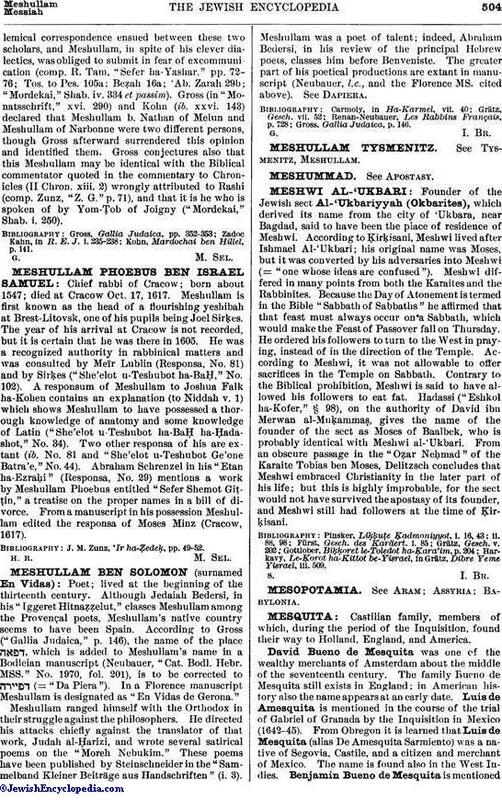 Gross conjectures also that this Meshullam may be identical with the Biblical commentator quoted in the commentary to Chronicles (II Chron. xiii. 2) wrongly attributed to Rashi (comp. Zunz, "Z. G." p. 71), and that it is he who is spoken of by Yom-Ṭob of Joigny ("Mordekai," Shab. i. 250). Kohn, Mardochai ben Hillel, p. 141.